I was talking to a neighbor I had known for years and realized we had something in common neither of us had realized. We both had been suffering from Fibromyalgia for many years. Neither of us had even realized it! People with fibromyalgia or chronic fatigue get really good at hiding their health issues. We look fine on the outside and people just assume we are fine. A good friend or close family member may notice. If your friend falls off the face of the earth and stops attending events and does not seem to be around much, you might want to check on them. They might be stuck at home resting in bed nonstop. If we were to start sharing all of our serious aches and pains and how difficult daily life is, the response is usually disbelief, even from friends and close family. It is easy to assume the person is just lazy. Year ago, physicians made it seem like it did not exist either and was just women who needed Valium or some way to deal with life. Of course this is not accurate and unfortunately for men, this disease is not limited to only women. You may not hear about it often, but men are affected by this disease as well to a lessor degree. Unfortunately to this day, fibromyalgia is not taken seriously by some doctors, family members and especially friends, neighbors and extended family. An interesting article called “This Earth That Holds Me Fast Will Find Me Breath” talks about Morgan Freeman‘s brush with death and resulting Fibromyalgia. In the article, it is clear that Morgan Freeman no longer is able to do some of the things he loved to do like pilot jets or sail. And, he is clearly in pain. This is the life of someone with fibromyalgia or chronic fatigue. “Every so often he grabs his left shoulder and winces. It hurts when he walks, when he sits still, when he rises from his couch, and when he missteps in a damp meadow. More than hurts. It seems a kind of agony, though he never mentions it. There are times when he cannot help but show this, the fallout from a car accident four years ago, in which the car he was driving flipped and rolled, leaving Freeman and a friend to be pulled from the car using the Jaws of Life. Despite surgery to repair nerve damage, he was stuck with a useless left hand. It is stiffly gripped by a compression glove most of the time to ensure that blood doesn’t pool there. It is a clamp, his pain, an icy shot up a relatively useless limb. He doesn’t like to show it, but there are times when he cannot help but lose himself to a world-ending grimace. It’s such a large gesture, so outside the general demeanor of the man, that it feels as if he’s acting. patients will see a host of doctors for different issues, neurologists for migraines, rheumatologist , orthopedic doctors and primary. As I learned, no matter how much help I would receive from my host of doctors, I still had a very poor quality of life. I started searching out ways to improve my quality of life, realizing I did have something to offer and needed to focus on what I can do instead of what I cannot. You see, depression haunts some people with fibromyalgia once they realize this invisible illness that no one understands is not going away anytime soon. Over the years I started trying all kinds of supplements and medications. I worked on changing my diet and eating healthier and finding things that helped with my pain. I was introduced to Beyond Healthy Chocolate and started seeing benefits but not huge. About four years ago, Beyond came out with a protein shake for weight loss. I figured losing weight may help relieve some of my fibromyalgia symptoms so I tried it. Instead, within a month regardless of weight I was losing, I started seeing benefits. For about 4 hours after each shake, I would have significant reduction in pain and energy which had been in short supply. Once I noticed the benefits on the Beyond shake, I was hooked. On a really bad day I will do two shakes a day. On a good day I have my shake for breakfast. I really can’t go without this shake. I could spend all day in bed without it. I take it with me if I have to go out of town. I really feel like I don’t have a life without it. I do take other supplements that my doctor suggested as well as a functional food medication Beyond assorted chocolates that help when I am in pain. But honestly nothing helps like this Beyond Chocolate protein shake. It helped so much that I was able to get off many of the prescription medications I was taking that were not making a difference for me and ones that were causing other side effects. 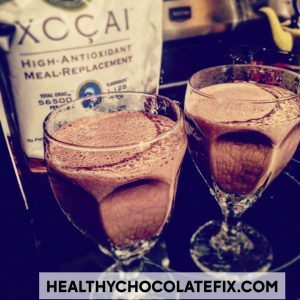 The shake I take has cocoa flavanols and a high amount of antioxidants per serving. One shake has over 56,000 ORACfn (the amount of antioxidants like those found in fruits and vegetables). It may be the combination of this and 20 grams of protein that help. 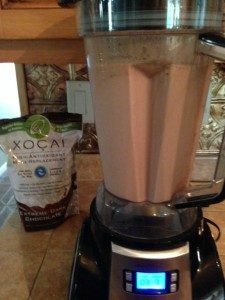 This particular shake is very low in sugar and is diabetic friendly, gluten-free, safe for those lactose intolerant and low in calories. My favorite shake recipe currently is made with 1 cup ice, 1 cup Silk unsweet almond milk, and 2 scoops of the Beyond Chocolate Protein Shake. My son makes the same shake and adds a touch of real vanilla which he says makes it taste amazing. I have another son taking this shake but his recipe is 1/2 frozen banana, 1 cup water, 1 cup ice, 1 tsp. peanut butter and 2 scoops of the shake. That shake is pretty darn yummy too. There are many recipes, so message me and I would be happy to email them to you. If you order your SHAKE as a preferred customer, and order something monthly, you will qualify for free product every 3rd month for the first year. You don’t have to order monthly but free product is awesome. Over the years I have incorporated the Beyond Activ and I take a swig mid day and evening to help with ongoing pain. If you want to talk about what Beyond products are working for me and what you may want to start with, give me a call at 941-216-5727. If I am not available, leave a message and I will get back to you as soon as I can. Blessings to you all and praying for pain free days for all of us! PreviousHealthy Chocolate Taking The World By Storm: Beyond Omega Chocolates In Great Demand In Decatur, Texas! NextHealthy Chocolate Taking The World By Storm: Beyond Omega Chocolates Exceed Demand In Akron, Ohio!